Pray, pray, pray when the road ahead is steep. Gotta pray, pray, pray when the valley plunges deep. Pray, pray, pray when I feel I can’t go on. Gonna pray, pray, pray ‘till God gives my heart a song. Gonna pray through every passing mile. Gonna pray through my tears; pray with a smile. Gonna pray for God’s strength to meet each day. Gonna pray, gonna pray, gonna pray! Pray, Pray, pray when the water’s rising high. Gotta pray, pray, pray when I’d really rather cry. Pray, pray, pray when a friend just can’t be found. Gonna pray, pray, pray, Jesus never lets me down. Pray, pray, pray when I’m tossing in the night. Gotta pray, pray, pray when I’m longing for the light. Pray, pray, pray when my hope is fading fast. Gonna pray, pray, pray ‘till the morning dawns at last. Gonna pray for God's strength to meet each day. Pray, pray, pray when the winds are blowing strong. Gotta pray, pray, pray when the storm is raging on. Pray, pray, pray when I find no place of peace. 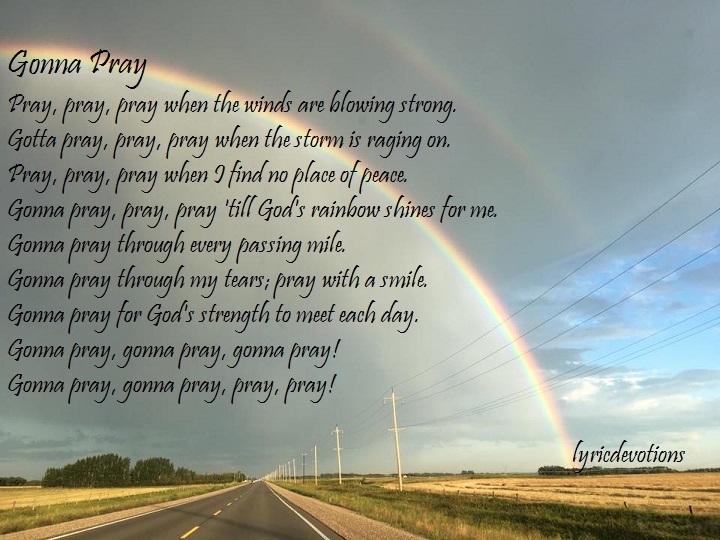 Gonna pray, pray, pray 'till God's rainbow shines for me. Gonna pray, gonna pray, pray, pray! In the fall of 2003 we built a house on my parents farm. Our first year in the new house, spring arrived early, and soon our entire yard was flooded. I told people I felt like I was living on the ark! But once the initial spring flood subsided we were able to get out and cultivate the ground and seed grass. Things were going well, until we got a May snow fall, and soon after that the rains came. One morning I went down to the basement to wake the kids, and to my shock and dismay, I found water streaming into the one bedroom that we had managed to get carpeted. Soon water was coming from other parts of the basement as well, and all we could do was vacuum it up and dump it back outside. During the long days of fighting the never ending flood waters pouring into our basement, I sometimes wondered how we would ever get through. Brian would stay up all night, sucking up the water every half hour, and then have to go to work the next morning, when I would take over vacuuming. After three days of this, we decided to just move all of our furniture to higher ground and wait out the flood. Most of the words to this song came to me as we fought the flood in our basement. It was devastating to see all of our hard work being ruined, and at the time I felt so alone, that we might as well have been living on Noah’s ark. But when we can’t find a friend, and the storm isn’t letting up, Jesus is always there; he never let’s us down. Matthew 7:24,25 Therefore whosoever heareth these sayings of mine, and doeth them, I will liken him unto a wise man, which built his house upon a rock: And the rain descended, and the floods came, and the winds blew, and beat upon the house; and it fell not: for it was founded upon a rock. Isaiah 59:19 When the enemy shall come in like a flood, the Spirit of the Lord shall lift up a standard against him. 1 Peter 5:7 Casting all your care on him; for he careth for you. Philippians 4:6 Be careful for nothing; but in everything by prayer and supplication with thanksgiving let you requests be made known unto God.